Keywords: Tuberculosis, lymph node, panoramic. A 78-year-old Caucasian male patient referred to Oral Diagnosis and Radiology Clinic, Gulhane Military Medical Faculty, Ankara, Turkey with a chief complaint of slight pain on the right side of mandibula and total edentulism of maxilla and mandibula. The medical history is not significant for any serious disease. On extra-oral examination a swelling on the left submandibular area was found. On intraoral examination the mucosal tissues were found normal in appearance. 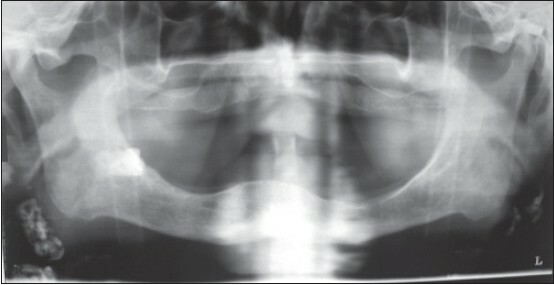 Panoramic radiographic examination revealed a horizontal impacted third molar tooth in the right side of mandible, and unexpectedly revealed bilaterally multiple discrete irregular calcified bodies in the both sides of the submandibular region [Figure 1]. The calcified body in the right side measured 30 × 12 mm, and on the other side measured 8 × 18 mm. He had no subjective symptoms; he was unaware of the existence of the calcified bodies. Questioning elicited no information regarding the presence of any discomfort or swellings in the involved areas. According to the patient's past history he had suffered pulmonary tuberculosis at the age of 20. The other findings in the medical history were non-contributory. The patient's tuberculin test was positive and the complete blood count and biochemistry tests were all within normal limits. 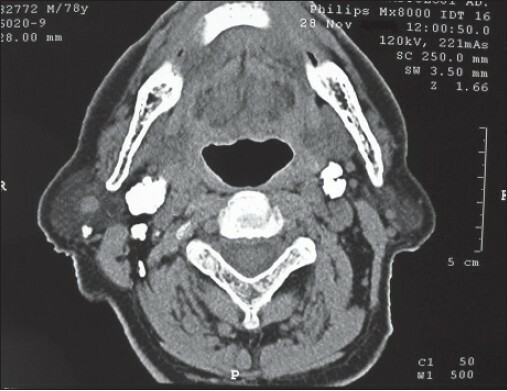 A computed tomography scan was ordered and axial non-enhanced computerized tomography (CT) showed multiple calcific lymph nodes at the level IIA-IIB and in the superficial lobe of the right parotid gland [Figure 2]. The patient was informed about the radiographic findings and decision was given to make total prosthesis and observe the patient. Although the tuberculosis is classified as pulmonary and extrapulmonary, 75 % of this is pulmonary. While pulmonary tuberculosis mostly occurs among males extrapulmonary tuberculosis mostly occurs among females. , Systemic symptoms of tuberculosis are fever, chills, night sweats, appetite and weight loss, pallor and tendency to exhausting easily. Smoking, genetic or hormonal features, alcohol consumption are attributing factors for tuberculosis. In the past, the most common cause of tuberculosis was ingesting unpasteurized bovine milk infected with M. bovis. It is reported that consumption of pasteurized milk significantly decreased the prevalence of such lymph node tuberculosis. , The patient in the present case has declared that he was living in a village and ingested unpasteurized milk in his childhood. We suggest that lymph node tuberculosis may have been the result of ingesting milk infected with M. bovis. Extrapulmonary tuberculosis can affect virtually any organ system but in many studies it is reported that lymph nodes are affected more commonly. ,,,, Lymph node tuberculosis is most commonly encountered in cervical lymph nodes. ,,, But, cervical lymph node calcification is a rare condition. Tuberculosis calcifications mostly occur in the nodes of chest and abdomen. Eisenkraft and Som  have reported that only 1% of the 2300 neck CT scans revealed cervical lymph node calcification. The range of the incidence of cervical lymph node calcification in lymph node tuberculosis was reported as 6-7 % in other studies. , Calcified lymph nodes were generally characterized by scars and swellings in neck area, but the patient in the present case showed no scars but swelling on the left submandibular area. Cervical calcified lymph nodes were first encountered as incidental findings on panoramic radiographic surveys. Differential diagnosis of calcifications on panoramic radiographs included lymph node calcifications, sialolith, radiopaque lesions of the bone, superimposed myositis ossificans, idiopathic calcification, ghost images, foreign bodies, carotid atheromas, calcified stylohyoid ligament complex, tonsillithiasis and phlebolithiasis. , Because treatment is unnecessary for symptom-free calcified lymph nodes and the patient in the present case was unwilling to undergo any further examination, surgical removal of the calcified lymph nodes was not done. In conclusion, the patient's past history and anamnesis should be carefully noted and encountered lymph node calcifications should be considered in the differential diagnosis of radiopaque nodes found on panoramic radiographs. 1. Ito FA, de Andrade CR, Vargas PA, Jorge J, Lopes MA. Primary tuberculosis of the oral cavity. Oral Dis 2005, 11: 50-3. 2. White SC, Pharoah MJ. Oral Radiology Principles and Interpretation. 6th ed. St. Louis, Missouri: Mosby Elsevier; 2009. p. 526-7. 3. Ishikawa K, Hoshinaga K, Maruyama T, Izumitani M, Shiroki R. Mycobacterium tuberculosis infection of bilateral cervical lymph nodes after renal transplantation. Int J Urol 2001;8:640-2. 4. Rothschild B, Martin L, Lev G, Bercovier H, Bar-Gal G, Greenblatt C, et al. "Mycobacterium tuberculosis complex DNA from an extinct bison dated 17,000 years before the present". Clin Infect Dis 2001;33:305-11. 5. Ilgazli A, Boyaci H, Basyigit I, Yildiz F. Extrapulmonary tuberculosis: clinical and epidemiologic spectrum of 636 cases. Arch Med Res 2004;35:435-41. 6. World Health Organization(WHO). Tuberculosis Fact sheet No: 104, Global and regional incidence. March 2006. 7. Öztop A, Ünsal I, Özgü A, Özgüven S, Köse I, Çakmak R. 1999-2002 Yýllarý Arasýnda Kahramanlar Verem Savaþý Dispanseri'ne Yapýlan Tüberkülozlu Hasta Bildirimlerinin Degerlendirilmesi. Toraks Dergisi 2005;6:243-50. 8. Kara MI, Yeler D, Yeler H, Ay S. Panoramic Radiographic Appearance of Massive Calcification of Tuberculous Lymph Nodes. J Contemp Dent Pract 2008;9:108-14. 9. Cailhol J, Decludt B, Che D. Sociodemographic factors that contribute to the development of extrapulmonary tuberculosis were identified. J Clin Epidemiol 2005;58:1066-71. 10. Aydin U. Tuberculous lymph node calcification detected on routine panoramic radiography: A case report. Dentomaxillofac Radiol 2003;32:252-4. 11. Wright SM. Massive calcification following tuberculosis. Oral Surg Oral Med Oral Pathol 1988;65:262-4. 12. Talukder MS, Huq MH, Haque A, Sarker CB. Extrapulmonary tuberculosis in surgical specimens. Mymensingh Med J 2002;11:104-6. 13. Hayati IN, Ismail Y, Zurkurnain Y. Extrapulmonary tuberculosis: A two-year review of cases at the General Hospital Kota Bharu. Med J Malaysia 1993;48:416-20. 14. Moudgil H, Leitch AG. Extra-pulmonary tuberculosis in Lothian 1980-1989: Ethnic status and delay from onset of symptoms to diagnosis. Respir Med 1994;88:507-10. 15. Jha BC, Dass A, Nagarkar NM, Gupta R, Singhal S. Cervical tuberculous lymphadenopathy: Changing clinical pattern and concepts in management. Postgrad Med J 2001;77:185-7. 16. Geldmacher H, Taube C, Kroeger C, Magnussen H, Kirsten DK. Assessment of lymph node tuberculosis in northern Germany: A clinical review. Chest 2002;121:1177-82. 17. Gormly K, Glastonbury CM. Calcified nodal metastasis from squamous cell carcinoma of the head and neck. Australas Radiol 2004;48:240-2. 18. Eisenkraft BL, Som PM. The spectrum of benign and malignant etiologies of cervical node calcification. AJR Am J Roentgenol 1999;172:1433-7. 19. Lee Y, Park KS, Chung SY. Cervical tuberculous lymphadenitis: CT findings. J Comput Assist Tomogr 1994;18:370-5. 20. Kim YJ, Sung KJ, Kim MS, Hong IS. CT manifestations of cervical tuberculous lymphadenitis. J Otolaryngol 1993;22:321-5. 21. Wood NK, Goaz PW, Lehnert JF. Periapical radiopacities. In: Wood NK, Goaz PW, editors. Differential Diagnosis of Oral and Maxillofacial Lesions. 5 th ed. St Louis, Missouri: Mosby-Year Book; 1997. p. 474.